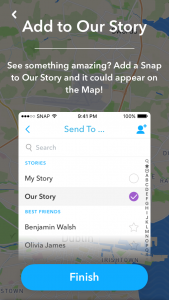 Webwise.ie / Parents / Get informed / Explained: What is Snap Map? The latest update from Snapchat includes a new location sharing feature. Snap Map allows you to see where your Snapchat contacts are, share your current location and view Snaps from nearby-Snapchat users or users at a specific event or location. The location sharing feature is available to users around the world. How Does Snap Map Work? Snap Map uses mobile phone technology to find out where its users are and then draws them on a map in real time. You can browse the map to see where your friends are and view stories from other Snapchat users. You can click on their avatars to see the photos and snaps that they have shared. Snap Map is an opt-in function and you can choose who you share your location with. When you open the Snap Map for the first time, you will get a prompt to choose your location settings for the map. Location settings can be changed at any stage using the settings function. Only Me (Ghost Mode): Your location won’t be visible to anyone else on the Map. You can still see other users’ locations. My Friends: Your location will be visible to all of your friends on the Map — including any new friends you make. Select Friends…: Choose specific friends to share your location with. Friends you select won’t be notified that you chose them, but they’ll be able to see your location on the Map. Your location on the Snap Map is only updated when you’re using Snapchat. Can other Snapchat users see my location? Regardless of what location setting you choose, you can get a Snapchat Story featured on Snap Map by using the Our Story function which can be viewed by anyone. However, it is not possible to view your profile information if your Story appears on the Snap Map. Update: Under the new E.U General Data Protection Regulation (GDPR), Ireland has now set the Digital Age of Consent to 16 years old. This means young people under the age of 16 in Ireland are not allowed to access this platform. 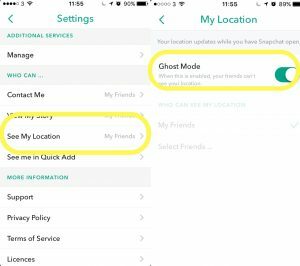 Choose your location setting: Consider using the Ghost Mode or selecting close friends, this will give you more control over who can see you. If you choose the Friends setting – Ensure you review your friends list. Do not share your location with people you do not know in real life. Location-sharing services can give other users a clear picture of the places you regularly visit (home, school, etc.). Consider whether this is information you want to share with others.